It's a well-known fact that women take longer in public toilets than men. It's partly because it is more than just a place to use the loo - it is often where women chat, bond, fix their make-up and their problems. Samantha Jagger has been documenting these candid moments between friends and strangers for almost 10 years. Instead of staging "Insta-perfect" shots, she uses a battered 35mm point-and-shoot camera small enough to fit in her handbag. 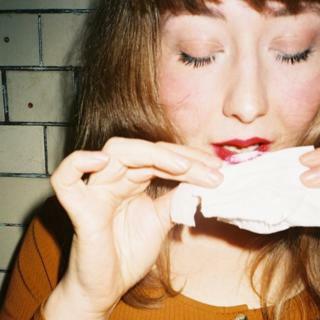 Her photographs, taken chiefly in toilets in pubs and clubs in Manchester and Leeds, are about to go on show as part of an exhibition called Loosen Up. 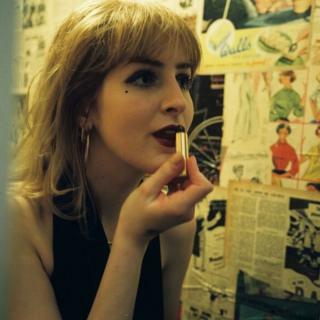 "I've been taking photos on film since I was in my teens, but it wasn't until last year when I was looking through them I realised how many are snapped in loos," says Samantha, 25. "It got me thinking about gaggles of girls coming together in toilets - breaking up, making up, gearing up. It all happens in that space and I find it completely fascinating. "It's this I wanted to capture and tell different stories about my friends' escapades." In that time, freelance journalist Samantha has seen "shoulders getting wet from tears, the dumping of girls and guys, pep talks, sympathy smiles, knickers in bins and flooded sinks". "One of my favourite memories was walking out of a loo and a girl was stood on her own making her face move around with with the [air from the] hand drier. "She thought she was alone so she jumped out of her skin. We had a right laugh and became mates." Audio recordings will be played at the exhibition of some of the women involved, in which they share their stories of what happened within the four walls of the WC. 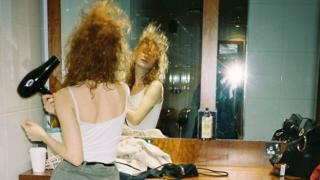 One is Charly Downes, 25, from Birmingham, who was photographed with her head over the toilet on a night out in January. "I was with a friend of Sam's called Hamble, it was only the second time I'd met her. "I had a few too many to drink and as [girls] do, you take you trip to the toilet together, and Hamble held my hair back while I was being sick." Samantha, who is originally from York and now lives in Manchester, said she likes the medium of film because it's "raw". "In a world where editing and filtering your life is rife, I snap that moment and that's it. "It's become a weirdly integral part of my nights out now. My mates roll their eyes now when I go in armed with a camera. "When I say I'm doing a project about toilets to people I don't know, there's usually a long pause. Then I explain the concept and I'm grateful to say people have been on board with the idea. "There have been some photographs I'm going to have to see about putting in the exhibition… I'll see if I'm allowed." Loosen Up will be held at The Brickworks at Barton Arcade Basement, Manchester, from May.